Attorney Michael Avenatti is facing charges in two separate cases: One in New York and one in California. Federal prosecutors announced the charges Monday, and authorities arrested Avenatti in New York. Avenatti is probably best known for representing Stormy Daniels in a high-profile legal battle against President Donald Trump. He's also considered running for president in 2020 and has become somewhat of a public adversary of the current commander-in-chief. In the case involving Nike, prosecutors accuse Avenatti of "threatening to use his ability to garner publicity to inflict substantial financial and reputational harm on the company if his demands were not met." According to the criminal complaint in that case, Avenatti said he had evidence that at least one Nike employee authorized and tried to cover up payments "to the families of top high school basketball players." The U.S. attorney for the Southern District of New York said: "By engaging in the contact alleged in the complaint, Avenatti was not acting as an attorney. A suit and tie doesn't mask the fact that at its core, this was an old-fashioned shakedown." Before his arrest, Avenatti tweeted he'd hold a press conference to discuss "a major high school/college basketball scandal perpetrated by Nike that we have uncovered." In a statement to ABC News, Nike said it "will not be extorted or hide information that is relevant to a government investigation." 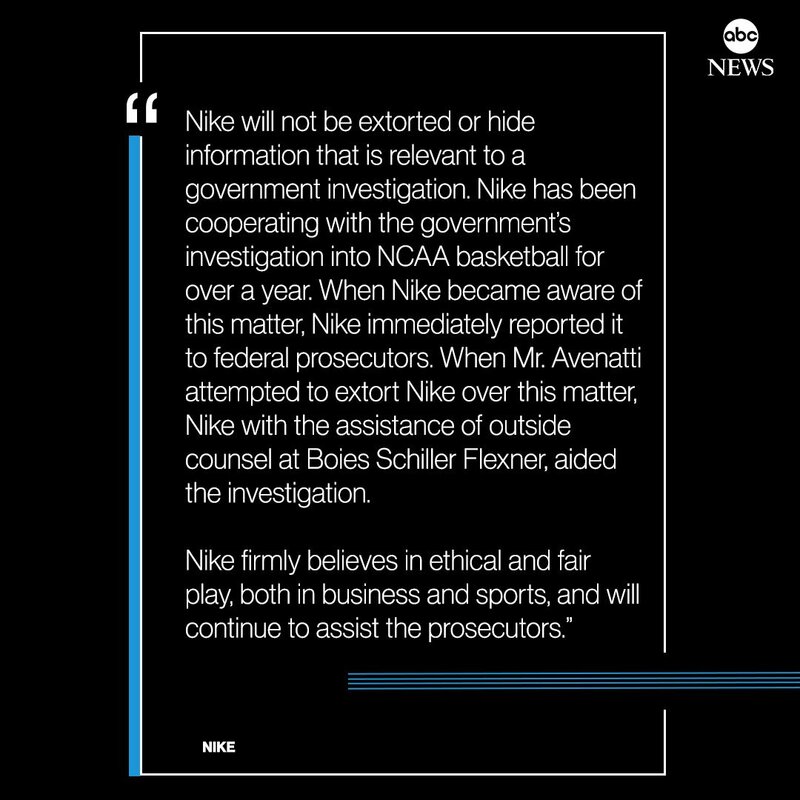 It also pointed out that it's cooperated with a federal investigation into NCAA basketball and said, "When Mr. Avenatti attempted to extort Nike over this matter, Nike with the assistance of outside counsel ... aided the investigation." In California, Avenatti is facing charges for allegedly using clients' money to pay his own expenses and defrauding a bank. According to an affidavit, Avenatti negotiated a $1.6 million settlement for a client but gave that client a fake copy of the agreement and had the payment deposited to his own account. The document says he used that money to pay his coffee business' expenses. The U.S. Attorney's Office in Los Angeles also accused him of using "phony tax returns" to fraudulently obtain millions of dollars in loans from a bank in Mississippi. At a Monday press conference, a U.S. attorney in California called Avenatti a "corrupt lawyer." Avenatti was released on a $300,000 bond Monday evening. He had to give up his passport and will only be allowed to travel to New York and California. He also has to end his contact with an unnamed witness.